Thanks to the Westerville Education Foundation (WEF), you can now contribute to Hartnell University by "adopting" Dr. Hartnell's classroom. Through the WEF "Adopt-a-Classroom" program, parents, grandparents, graduates, businesses, former oil executives and other industrial philanthropists, babysitters... ANYONE... can adopt classrooms throughout Westerville! Funds generated through this initiative can be used to replenish classroom supplies, provide awards for students, fund projects, off-set the cost of field trips, and purchase books. To read about "Adopt-a-Classroom" and to make a donation today... CLICK HERE! Nate G. - "I had a couple problematic high school years, and I hardly graduated. Due to Dr. Hartnell's style of teaching and ability to motivate students, his class was the only one that I applied myself at and one of the only classes where I earned an 'A'. Dr. Hartnell is one of the few people that believed in me and saw through the exterior I hid behind throughout those years. The year I had him as a teacher he nominated me for the Breakfast Club. Dr. Hartnell (and other people like him) are the reason why I am where I am today - the last 2 years I have worked at the Pentagon on the computer network defense team and malware analysis team. Now I am the CISO at a small government contracting company, happily married, owner of a house, and a soon-to-be father. I sincerely believe that Dr. Hartnell is an exceptional person and one of the most outstanding teachers of all time. I still talk about him to this day." 'Rocketttpower' from Buzzfeed - "Dr. Hartnell has basically been the Beyoncé of history teachers for 15 years (a.k.a. the best of the best). His unique approach to teaching has inspired thousands of students, made them enjoy the hell out of his class, and gets them excited about history (and learning in general). Trust me, if anybody deserves your leftover milk money, it’s this guy." Emily Wilkin - "Dr. Hartnell, You are a truly amazing teacher. I've been around the country, and now the world, and I've never met anyone who parallels your passion for teaching. Keep being awesome!" Linda Senser - "Your work is amazing. Thank you." Mark Aseltine - "I was very fortunate to have Dr. Hartnell as a teacher in both middle school and high school. I echo the many sentiments here about Dr. Hartnell's talent for teaching history. However, I believe the greatest thing I learned from Dr. Hartnell were the lessons he taught me as a role model. 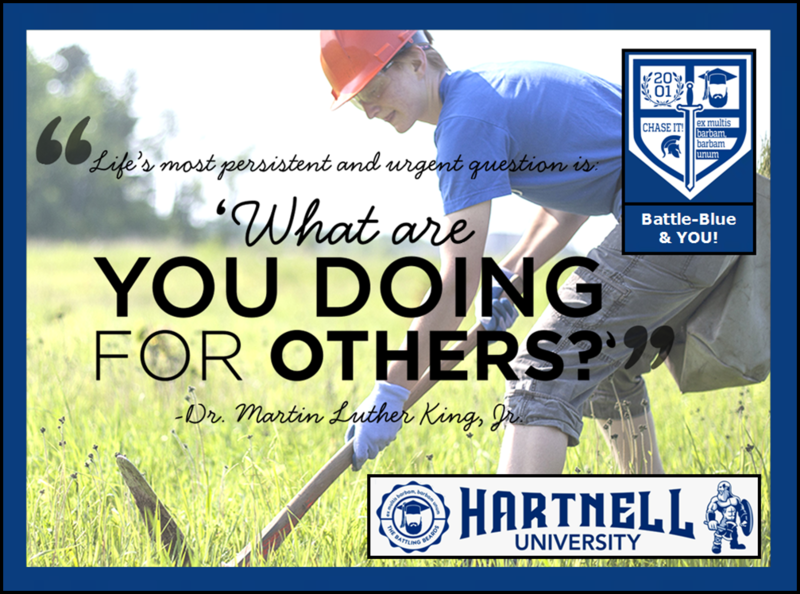 Dr. Hartnell is somebody willing to work hard, somebody not afraid to take things to their logical extreme (and slightly beyond) and somebody who is able to meet his students where they are (mentally and emotionally) and make a strong impact in every student. The lessons I learned from Dr. Hartnell helped me through different challenges in high school, through my undergrad and masters degrees and continue to pay dividends in my professional career. I wish this fundraiser would have happened before so I could have supported his remarkable efforts sooner." Belinda Biddle - "I have ALWAYS thought that what makes history interesting is the story! I wish more history teachers could be like you!!" Cortney Cotts - "Dr. Hartnell remains, to this day, the best teacher I have ever had. He brought history to life. He made it relatable and fun and scary and wonderful. I looked forward to his class every day and (basically) refused to take history with any other teacher while I attended WNHS. I know he meant the world to my brother, as well. We both had those 'My history teacher can beat up your history teacher' bumper stickers on our cars until they died. Dr. Hartnell is an amazing man, and it makes me so happy that so many people have reached out to support him. Thank you for inspiring your students, past, present, and future." Jarris Cooperrider - "Hartnell is and always will be one of the greatest teachers I will ever have had the opportunity to have known. He brings so much enthusiasm and sincerity into his classroom to ensure his students receive the best education possible. Best of luck! Thanks for everything you have done and continue to do!" Alex DeWeese - "Mr. Hartnell when I was in school, now Dr. Hartnell was the most influential teacher/person I've had in my life. Words can't describe how much I enjoyed his class, one of the only classes in my high school and college life that I truly looked forward to every single day! Thank you so much for being there to hand not only my diploma but also Kyle's, Justin's, and Kristin's as well. I know they all feel the same and would have no problem saying that you were and still are the best teacher that any of us will ever have! I know you will reach your goal because of the impact you have on people's life each and every day!!!" Hochstetler Family - "As a teacher, I can honestly say I have never seen anyone give so much of their time, energy, and personal resources to create an environment where students get genuinely excited about learning. Thankful that Johnny and so many other students have experienced (and will experience) Dr. Hartnell's passionate tradition of making history come alive for his students!" Bob Hicks - "To a man that made a positive difference in my son's life!" Bev Fansler - "Dr. Hartnell is the greatest teacher my kids have ever had. My son was a quiet, shy freshman who needed a place to fit in. Dr. Hartnell opened his heart and classroom not only during class time but during lunch and before and after school to all kids who loved history and needed to place to hang out. Dr. Hartnell truly understands different types of learning styles and helped my son be successful academically and also socially. My daughter encountered Blue Books for the first time as a freshman in Dr. Hartnell's class. This stretched her academically like she had never been stretched before. By the end of the year she had grown so much in her writing skills. Now as a sophomore she is continually using those writing skills and knows she is able to be successful due to being tested by Dr. Hartnell. As a parent, I am grateful both of my kids with different learning styles were able to be a student of Dr. Hartnell's. They are both better students and learners because of him." Becki Bradley - "Needed to wait until Payday to donate but did not want to miss the opportunity to be a part of this! I was new to the area when I took Dr. Hartnell's class and because of the environment he created I went to school every day excited to see what would happen in class instead of being preoccupied with how scared and nervous I was to be in a new school. A year later, when I was no longer in his class, my mother passed away. I remember Dr. Hartnell as being one one of the (many) members of the Westerville North community who went out of their way to encourage and reassure me when it felt like my world was falling apart. I will never forget either of these things and am so proud to be a part of keeping this class going! You go Dr. Hartnell!!" Tammy & Ben Ridout - "Thank you for all that you do to educate and inspire your students. They are our future... and the world will be a better place because of the impact you're making on their lives." Erika Hickman - "Graduated 10 years ago from Westerville North, and I never had Dr. Hartnell as a teacher but heard nothing but terrific things about him as a teacher! You deserve this!" Blair Stackhouse - "This is amazing!" Erin Martin - "I admire what you are doing with your students to get them interested in learning history. You rock!" Tom Bonacuse - "Caitlin and Duncan loved your class. Both of them think very highly of you as a teacher and a person. This donation is on behalf of my and other poor college students." Cathy Bagot - "Given in memory of our daughter, Laura Bagot, a classmate of Ben's." Sean Mackowski - "It never hurts to donate to a truly dedicated professional that strives to build up his students into good, educated citizens. Although I was never part of his class, it's exceedingly clear that Dr. Hartnell goes above and beyond to create an effective classroom environment that keeps students engaged and excited to learn." Abby Bouton - "Thank you so much for everything you did for me! You had such a positive impact on my life! You are the most influential teacher I have ever had. Out of every class I have ever taken, I have retained the most knowledge from yours. I wish everybody received the opportunity to have you as their teacher!" Monica Flynn - "Any one that tars and feathers my daughters (and posts it on his website!) deserves support! You're not just a teacher, you are an experience. Casey, Megan, and Bri simply adore you. Thanks for all you do!" Anne Moc - "My daughter has said countless times that 'Dr. Hartnell is the best teacher I have ever had in my life.' I have never seen her work harder, be more motivated, or learn more than she has in your class. If she could take you ever year, she would! Words can not describe your passion and dedication to your teaching and your students. She will carry what she has learned, and your faith and confidence in her, with her forever. Here's hoping my younger daughter gets you in 3 years! Thank you!!!!" Denise Barlow - "I loved reading your story and seeing the pictures. Best Wishes!" Brooklyn Shoup - "I went to high school with Nate, and I remember how he looked up to you (whether you ever knew it or not). When I was growing up in CA, I went to terrible schools but had just one amazing history teacher who had a passion for Civil War reenactments. He was the only teacher to this day that I can remember vividly making a difference in my life. What you do is not only valuable but; for many children extremely necessary. Your family must be so proud. I do not know you personally; yet I feel pride for the work you do at North! Well done Sir." Conor Gerrity - "This was the only class that ever taught me anything in high school. Not only did i actually learn from the class, but Dr. Hartnell actually makes his own material! Every other teacher I had just found something on the Internet and printed it out for us. If every teacher was like Hartnell, America would be number one in every single subject. By far the best teacher I have ever had." Blake T. - "In the words of the infamous WWF superstar Rowdy Roddy Piper, 'Dr. Hartnell has come here to chew bubble gum and kick a$$... and he's all out of bubble gum.' Keep being who you are - never change!" Cathy Sliwinski - "Dr. Hartnell, You don't know it, but you were in front of me in the check out at Meijer, and the young cashier unabashedly told you how you changed his life... how you enabled him to understand that he COULD make something of his life...that he COULD pursue college, and that he was so thankful that you were a part of his school career. A couple of years later, our son Robby was lucky enough to have you as a teacher. He has easily ranked you as one of the most influential educators he has ever known! Thank you , thank you, thank you!!" Doug & Diane Fosselman - "You have built a great community! God bless!" Carrie & Anthony Ceresa - "It's so exciting to see your passion for teaching. We hear your name on a regular basis as one of Westerville's best. We need more of you! We only hope that Alex and Liliana will have a chance to experience your class!!! Keep up the amazing work. :-)"
Ryan Sroufe - "Still talk about Dr. Hartnell's class to this day in the barber shop! One of the best teachers I had all through school. Truly leaves a lasting impact in people's lives!" Juli Kernodle - "You rock... Please keep teaching until my 8-year-old gets to North!" Joyce Shipley Sisk - "In remembrance of MY two greatest teachers, Gladys O. Reeder, Brown Township Elementary School, and Elizabeth McHugh, Franklin Heights HS. Class of 1959." Raelena Robinson - "By far my daughter's favorite teacher. You make a difference each and everyday. You've sparked several conversations and debates in our home with "conspiracy theories". You've given Olivia a desire in history that I never had. Thank you for all you do. You are appreciated." Cheryl & Allen Smith - "You've had such an impact on our family. Your integrity makes us lifelong fans, and we'll never forget the experience of coming in curriculum night and seeing your classroom for the first time. We'll no longer see you on daycare drop off/pick up, but hopefully we'll see you at another curriculum night in seven or eight years." Brittany Hyde - "Best history teacher I had!" Reta Brown - "Thank you for giving my grandson a great year in history. I loved hearing about all your lectures and fun history lessons. Trent has thoroughly enjoyed your class. Thank you again." Molly & Fraser Hartnell - "Your dedication to teaching other people's children is what makes you such an amazing father and role model for our son." Kimberly Bernacki - "Thank you Dr. Hartnell for all your hard work and creative teaching abilities. You have had a profound impact on my daughter, Haley Jo Conley. I will never forget the heartfelt note you gave her after a Blue Book Exam. It will never be forgotten, that's for sure!" Steve Polhamus - "Proud to donate to a fellow Warrior and Spartan. Keep doing your thing!" Ben Gill - "To the greatest teacher I've ever had. Thanks for saving me from failing high school!" Jim & Toby Hosty - "We are so proud of what you do for the students of Westerville North!" Leslie Lyon - "Hooray for you Dr. Hartnell and all that you do! I wish all educators were more like you, and I know a few that could learn from you! My daughter Sam has really enjoyed having you as a teacher this year, thank you for that! You make learning fun and there should be a lot more of that in this world!!" Debi Abbot - "Thank you. Many years ago I had a professor in college who brought history to life & applied it to my life. Big 180 degree turn in my life & thinking! Keep on slogging through, you never know whose life you may change for ever." Mary Lou Gannon - "I have heard outstanding comments about you and your class!" Tom Armstrong - "Dr. Hartnell, even though I do not have you as a teacher (yet), you are awesome. Thank you for making history so much fun. Lower taxes, more beard!!" Jeff & Val Hartnell - "We are pledging a dollar for each year that we have been blessed to have you as our son." Leah Hanson - "What you're doing is incredible. The history of our country is incredibly important. As the granddaughter of a former veteran, I salute you. Kudos to you sir! Keep on keeping' on!" Marleen & Fred Geyen - "Thinking of you and so happy to hear how you teach!" Kathy Cocuzzi - "Keep up the great work!" Justin Largent - "For Sparta!!!" Rachael Cronin - "You're the best teacher ever! I failed the $h!t out of most of my Blue Books, but you kept helping me. I went to all your study groups for the final and finally got an A-. Most important/earned grade of my life, and I was so proud of it. Thank you for being awesome and always entertaining!" Lindsey Possehl - "Your inspiration is truly amazing and the passion you share with your students on a daily basis is contagious. I only wish my kids would have a chance to experience history like you deliver it. Any chance you want to move to AZ in a few years? Best of luck!" Amy Graeff - "I had Dr. Hartnell when he first began teaching. He is by far one of the best educators I have come across throughout my academic career. (This includes college and law school!) I graduated in 2005, but I will never forget his enthusiasm and love for teaching. I am so glad he has continued to be such a great part of Westerville North! Good luck!" Beth Morvay - "I never had the chance to be in your class, but I know you rocked Dan's world as a coach. You're an inspiration, and I need to pick your brain sometime about standards-based grading... Rock on!" Jon Wilkin - "Love supporting a great cause and a great person. I also love seeing all the kids and the lasting impact one can make." Ryan Stanley - "I had the honor of playing basketball under Coach Hartnell, but I did not join my three other siblings at WNHS to have the opportunity to take his class. He was my favorite coach that I have ever played under - his dedication to his players was just as great as his dedication to his students (or his Spartans)." Brianna Flynn - "Dr. Hartnell, Thank you for all that you've done for me and for my sisters. I am in my junior year of college, and history still persists to be my hardest subject... There's just something not wired correctly in my brain and it makes history very difficult for me to learn and remember. However, this semester I was having a discussion with someone about the amendments and it is solely your class that has helped me remember those! (24... Four...floor....something about a stripper pole....pole.. Poll tax!) I do that in my head every time and it works! This is just one example of quite a few where something sparks in my head for me to know this information. It is because of you and your ways that I actually did learn and remember history. So I thank you so much for that. I will try to keep this short, I need to just come in and see you, but a few updates- both Megan and Casey are now lieutenants in the army. I will commission into the army next year. I will also be getting married in about a year. Crazy that I beat my sisters! I hope the baby is doing great, I realize he isn't much of a baby anymore! Hope to visit soon, thanks again for being the greatest and most effective teacher I have ever had." Bradley Marzola - "Truly, one of the greatest teachers I've ever had the privilege of having. I'm glad I can help out so that future students can enjoy your class as much as I did!" Michael Evans - "By far the most enthusiastic teacher I ever had. Great teaching style that should be adopted by more teachers." Robyn Stern - "You are awesome. I wish you the best in your next 15 years of teaching." Tobias D. - "For inspiring someone who inspires me." Robert Tener - "Dr. Hartnell, we are more than happy to support you. While challenging, Joseph talks about his love for your class every week, and we appreciate all your work." Erin Thompson - "You are beyond an incredible teacher, and I am very thankful to have you in my life after four years of being your student. You have inspired me and given me strength in myself and are always so encouraging. Keep being you, and don't let anyone stop you!" J. Lacy - "Although I never had you as a teacher, you were still able to leave an impression on me. Who could forget the costumes you wore to school, and stories of your lectures from friends who had you as their teacher. I'll never forget on Halloween one year when you cheered on my friend and I having a lightsaber battle in front of the school. You deserve this gift from everyone because everyone knows it will go to bettering the education of your future students. Thank you." Lauren Harmon - "To the most inspirational, dedicated & passionate teacher there is. Dr. Hartnell is by far the best teacher there is, and I was lucky to have him as a teacher and have him hand me my diploma. Keep up the good work Dr. Hartnell!" Krista Dombroviak - "I worked with the dad of one of your students from several years ago, and even he thought it was pretty cool that I went to high school with you. I'm happy you are so passionate about your work. It obviously does wonderful things for your students." Leslie Matsumoto - "You were the first teacher Colin ever had that taught him the value of hard work and going above and beyond. The Blue Book was the best preparation for college. You gave him so much more than a history lesson and made it interesting. Thank you:)"
Rebecca Hutchison - "Dr. Hartnell was one of the most talked about (in a good way) and influential teachers at North when I was there. Even though I never had him as a teacher, I hope this small donation helps him to continue to inspire, uplift, and encourage future students. Keep it up, Dr. Hartnell, you are an invaluable resource to your students, WNHS, and the greater community of Westerville as a whole." Andrea Gyurko - "Keep up the fabulous work!!" Fana Abraha - "Dr. Hartnell, you are by far one of the greatest teachers I've ever had. Your passion and dedication for teaching is so inspiring. We are all so lucky to have such an amazing educator like you. Keep doing great things!" Mandy Sargel - "Dr. Hartnell and his class made me a better writer, student, and person. I can't thank him enough for all that he did for me when I was his student. The time and effort he puts into every little detail of his teaching is absolutely amazing. So many of my greatest high school memories came from his classroom. It truly is a one of a kind experience and I feel so lucky to have had him as a mentor. Thank you so much for your dedication to education and creating such a fun, unique, and welcoming classroom environment, Dr. Hartnell!" Sarah Elkins - "You are the most memorable and best teacher I ever had!! I tell the kids I work with about you all the time. The great water ballon fight. Trying on the chain mail and being pronounced a child soldier. The tar and feathering, the sneaking out on sleeping classmates.... they don't believe you are real! You are amazing and do so much for you students. You are truly an amazing teacher. In the words of that immortal Henery Adams, 'A teacher affects eternity; he can never tell where his influence stops.'" Alex McClintock - "Glad to see the passion for teaching still running strong. Good luck to you." Emma Feder - "Your class pushed me harder than I ever could have imagined, and I couldn't be more thankful for that. Ultimately, it shaped my high school experience and who I became as a student because your class taught me how to learn. The fact that you see potential in all students and encourage them to see it in themselves inspired me freshman year of high school and continues to inspire me in my junior year of college." Jon Myers - "You're the man, Dr. Hartnell." Michelle Ulrich Nagy - "Very proud of my classmate and what he has accomplished at our old school! Great job!" Adam Cheadle - "You were definitely an inspirational teacher! I was excited when I found out that you were going to be a teacher at WNHS and I feel privileged to have been a part of your first year. Man time flies! Best of luck to you for continued success!" Stephanie Hoenie - "You are such an inspiration. I've never met anymore more passionate about their craft. I know you will continue to change the world." Colin Matsumoto - "Mom said it best. Nine years later, Hartnell's class is still with me." Jim & Anne Dean - "Thank you Dr. Hartnell for having such a profound impact on our daughter Kelly! You are one of the best!" Danni King - "You have inspired me for so many years. You made my high school experience a thing to cherish and made me feel special in a sea of hundreds. I cannot thank you enough for your wisdom, kindness, and dedication." Trey Fisher - "This man is one the greatest teachers. Every class was like a stand up comedy show. I still have his very detailed list of every horror film ever. One of my favorite memories of high school was reenacting the final fight in 'The Last Samurai' for the class for a student that was absent. Also him running through the lunch room in full chain mail and a Mel Gibson 'Braveheart' outfit yelling 'FREEDOM!!!!!' with a 7 ft broad sword." Dave Kelley - "Keep up the good work." Katie Knies Bernal - "Haven't seen you since high school, but so glad to hear what a great success and inspiration you have become. Keep up the great work!" Doug Leedy - "One request. I would love to come in and see first hand what a day in the life of Dr. Hartnell looks like. Can't wait to see!!!" Sheila Gill - "If I have one regret it's that I did not get to be your student! You have created a learning environment that rivals the best I have ever seen. Trust me your students will learn and retain more from you than any learning experience they will ever have ! I simply ask for an opportunity to sit in on class some time. Seeing what you have accomplished and created makes me so proud to know you. Please know what a difference you make." Kent Ford - "Coming from a non-history oriented person, I have never been so encapsulated in a class as I was in Dr. Hartnell's history class. On top of his one of a kind teaching style, Dr. Hartnell has been there for myself and my family more times than I can count. Thank you for everything." Rick & Irene Geyer - "Thank you for all the amazing work you do for the students. Kelsie enjoyed your unique teaching style and learned so much from you. You are a true inspiration to all!" Scott Gerber - "I was fortunate enough to have had you as both a teacher and a coach. From Physical Fridays to Battle Reenactments, you never failed to keep things fun and interesting. Thanks for everything!" Tyler Coate - "Best teacher I've ever had. Favorite class of all time. Keep up the good work, Dr. Hartnell." Sophie Stati - "Keep inspiring!" Justin Brewton - "Dr. Hartnell's class was easily one of the best memories of my high school experience. His passion for teaching history has stuck with me for a lifetime and is a testament to how to approach your craft with passion." Cara Pugh - "I cannot thank you enough for all of the hard work, dedication, and creativity you put into your teaching. Teachers like you are a huge part of the reason I became a teacher myself. Thank you for teaching us (all of your students) how to make learning fun and interactive and what it means to be truly passionate about what you do in life. You are amazing!" MacKenzie (Bartlett) Whitman - "This class by far taught me more about myself as a student than any class I have ever taken. My mom still talks about the holiday packets that we've had for going on 10 years now! I am glad to see that future students will not lose out on such an amazing experience!" Katie Morrison - "Keep up the great work!!!" Mary & Ron Taylor - "Thanks for all you do, Dr. Hartnell... From one WCS teacher to another!" Jessica Henry - "Proud to have you at WNHS, and inspired by the comments and anecdotes of the lives that you have touched. Keep it up!" Lauren O'Connor - "When I was little, Big Ben was the crazy neighbor with the giant red beard and the numerous, incredible costumes. Then he became Mr. Hartnell, and he was the greatest teacher I've ever known. He taught me what it means to be passionate about something, taught me determination and hard work. He held nothing back from us, including the never-forgotten medieval torture lecture, and he empowered us to try our absolute hardest. I still tell people about my freshman history experience! Now he's Dr. Hartnell, and there is so much more that can be said. He's an inspiration to students past, present, and future. Thank you for your dedication to education, history, and most of all, to your students." Kevin Hosty - "I can only hope that my children will have a teacher like you! Keep up the great work!" Brenda & Jan Feder - "We are happy to support Dr. Hartnell's exemplary teaching. He is that rare teacher who works his students hard, yet they still love him. Keep up the great work." Joanna (Cocuzzi) Studebaker - "When people talk about great teachers, I tell them about Dr. Hartnell who would dress up in costume and make history come to life. While studying the progression of a war, he added a small image of a fire in the corner of his presentations. As the war progressed, the fire got bigger. He did it to see who would notice. Who does that? Crazy awesome teachers." Jeffrey Gardner - "Go Green! Sara Berky - "One of the greatest teachers I've ever had! I took so much away from this class - history, politics, test taking skills, writing skills. It's incredible how fun and diverse this class was." Missy Hicks - "Thank you for everything you do Dr. Hartnell. While I never had you as a teacher I see the amazing things you do for your students. You are so inspiring and I know you will continue to motivate students for years to come." Amy (Patton) Yarman - "Proud of all that you have accomplished! And honored to have been your fellow classmate. You were impressive then and nothing has changed (except the facial hair). Best of luck!" Olivia Hubble - "I still brag about winning Presidential Fight Club. (Andrew Jackson upsetting FDR? That's a huge deal.)" S.G. - "One of my favorite classes ever. Hartnell - you are a great teacher, and it's awesome to see how your classroom has grown 10 years later." Cody Rostorfer - "Dr. Hartnell is the greatest history teacher. He does everything for the students and creates a hands on environment to make history fun. I remember doing the Civil War reenactment all four years of high school. It was a true honor to have him as a teacher and a bigger honor to have him as a friend." Erin Latta - "By far my favorite class and one of the greatest teachers out there!! Thank you for all you do!!" Ryan Cochran - "The man is a legend! Awesome seeing my guillotine is still standing!" Joy Rose - "Keep up the good work." Maria Petrozzi - "From one Westerville teacher to another... thank you!" Kevin McCartney - "Dr. Hartnell's class was one of my greatest memories of my high school career. I wish I could go back and take his class again!" Kara & Zachary Kent - "From one teacher to another... What an amazing educator you are! We are so happy to support you. Your students are blessed to have you bring history to life for them." Lisa Sargel - "'The Doctor' is how you were known around the dinner table at our home! Your dedication to your career and our children is astounding and so very appreciated. I always felt guilty only donating a ream or two of paper every year, and now I am happy to be able to do more. The Westerville City school community is blessed to have you on their faculty. Thank you!!" Bre Rhodes - "The best part of high school was Dr. Hartnell. I hope he can continue to inspire kids and adults alike for many years to come." Megan Poole - "I am one who is never good with names. So history was a hard subject for me. Dr. Hartnell made the class fun and I learned so much. I learned more about history in his class then any other history class. He made me want to know about our past. He is a teacher who cares about every student and a teacher students come back to see even after graduation. He is an amazing teacher and will continue to inspire students. Thanks Dr. Hartnell!" Ramona Bhatt - "Aw Dr. Hartnell, seeing this brings back such great memories of your class! I'm just a poor medical student so I can't donate much, but every little bit helps right? I hope you are able to keep inspiring students every day, just like you inspired me! Thanks for everything :)"
Matt Millikin - "Your students are so lucky to have you. Keep up the excellent work, buddy." Dave & Jane Collinsworth - "What great opportunities you give your students! We hope you continue to 'soldier on' for many more years!" Tara Carnes - "Thank you, Dr. Hartnell, for everything you do for your students. Your passion for teaching is admirable, and your fun, crazy approach to learning has left an impression on all of your students. Because of you, many of your students have pursued teaching as a career. Thank you for the impact you had on me, and for teaching in such a way that all students understood. Let's all help to ensure that his students continue to learn the same way that we did!" Ghazy P. - "Dr. Hartnell, if you are reading this message, I just want to let you know that you are a phenomenal teacher! There are other great teachers at North too! I learned so much from your freshman U.S. Global History class! Your creative teaching methods effectively engaged every student on a daily basis. What I got back from your class is that history isn't about you, but it's about everyone. Your message to everyone was, 'Everyone sitting beside you has a story to tell.' Learning isn't about accumulating points, but is about the reflection and understanding the course material. $10 seems to be a small amount, but it does makes a difference! I hope you continue your passion for investing in your students. That's what matters the most." April Hopper - "Dr. Hartnell was an awesome, creative, inspiring teacher. History was one of my worst subjects in school and therefore my least favorite class to attend. Not this one though! I loved Hartnell's class! It was always fun :) I'm jealous to see how much I've missed out on since graduating! Dr. Hartnell wasn't only a great teacher, he was there as a friend as well. Thank you for all you've done and continue to do! Good luck! '05!" Leah Schultheis - "For one of the greatest teachers that I had the privilege of learning from. This incredible outpour of support and love is a reflection of your dedication and passion for teaching. Thank you for everything you do for your students. Go buy yourself a Whatchamacallit to celebrate your success." Trevor Jones - "Phenomenal teacher! We need more like you! Thanks for all that you do!" Josh Evans - "He was hands down the best teacher I have ever had. I admire his enthusiasm and he is one of the main reasons that I'm studying to become a history teacher." Danny Donovan - "Hope all is well!" Nancy Cowee - "Dr. Hartnell is one of W.N.H.S. greatest teachers!!!" Lauren Schmidt Hissrich - "I'm in awe, reading all the comments from kids who have been inspired, lives that have changed. Keep doing what you're doing! What an amazing way to give back... and pay it forward!" Kori Upp - "I had a such a great experience having you as a teacher even when you didn't have a classroom. Thank you for being the type of teacher and person you are!" Katherine Touzinsky - "To the Doctor - $30 is an embarrassingly small gift to give in exchange for what you've given me - a lifelong love of learning. There are a handful of people in my life that I can honestly credit for that, and you are most certainly one. Thank you!! And keep on giving!!" Jeff Barnett - "King Benjamin rules another school year! One of the greatest teachers I ever had, and now a legacy at W. North continues!" Chad Cochran - "Even being a Spartan, Dr. Hartnell makes his class come to life. If more were like him, the future would be better off." Mollie Moore - "It's not often you come across a teacher who possesses such genuine passion, and truly loves their job. Although I never got to experience your class, I have many friends who did and they have nothing but wonderful things to say about you. Wish you all the best!" Chris Deinlein - "It is my pleasure to contribute to my former teacher's cause to continue his creative teaching methods. I was able to learn many things from Dr. Hartnell as his assistant coach, student, and friend. This man has a true passion for teaching, and I couldn't be more proud to see him continuing to be the ultimate embodiment of the Warrior Way. You da man, Hartnell!" Megan Flynn - "This was, and will forever be, my favorite class. The memories you provided with us students will always put a smile on my face! (I threw in a little extra because my picture made your website!) Hope all is well. Miss ya, Dr. Hartnell!" Jen Bernsdorf - "My oldest Matthew had Dr . Hartnell, and I hope Andrew can be so lucky next year as a freshman! Hillary Phillips - "Dr. Hartnell's class was by far my favorite in high school. Even though I didn't realize it, it was creating the most engaging learning environment he could for young teens. And because of him and 'Amendment Survivor Island,' I will never forget that the 16th Amendment gives the Federal Government the right to raise a Federal income tax." Emily Case - "I will never forget your class! Thanks for the fond memories!" Briana Braver - "This man was the only reason why I ever enjoyed history. He was the best mentor I could have asked for." Kelly Dean - "Dr. Hartnell is by far the greatest teacher there is. I was so blessed to have him for two years. I never dreaded coming to class, and it would be the best part of my day. Thank you so much Dr. Hartnell for truly caring about your job. You were such a great role model for Katie Antle and me, and I am blessed to have built a great relationship with you. Good luck, and I will be by to visit soon!" Jessica Keller - "Happy to support my favorite teacher of all time!!" Lauren Bellflower - "Happy to see so many students from my class of 2007 donating. Keep inspiring students to achieve more and love history. Always inspiring those to live life with passion!" Jordan Hummel - "I'm very excited to help with this. Dr. Hartnell's class has grown tremendously since I was a part of it in 2005, but it was still one of the most memorable parts of high school for me. That class was the embodiment of how important a good teacher can be to a kid, and I really hope this project helps. Good luck, Dr. Hartnell, and I hope they still let you run through the cafeteria with a sword." Jared Bradley - "Great class, wish it the best. All education should follow this style of teaching." Luke Shomo - "Coach Hartnell was hands down the most impactful mentor I had throughout my years in school, and his passion has positively affected me as I've carried on my life. His classroom was just the tip of the iceberg to the lengths he would go to inspire and excite students about the importance of education, and his ability to put it in a real life context goes absolutely unmatched." Amanda Vogt - "To the most passionate teacher I have ever had the pleasure of being taught by throughout my entire education... You deserve much more than what you are asking. I will never forget sitting and learning in your classroom. You have such a powerful gift. Never stop." Bryan Hathaway - "Your class was amazing. I still have a few of the packets you gave us in '07. The Civil War water balloon reenactment and the tar and feathering lesson went down in my book as the best classes ever. Thanks for putting so much time into your teaching. You helped inspire me to become a teacher." Casey Flynn - "This class was the first to teach me how hard work pays off. You are truly inspirational, I am blessed to have been your student." Dave Weaner - "I have the GREAT personal pleasure and professional collegiality to have taught with Dr. Hartnell over his time at WNHS - and even the thrill of getting involved in (what I consider his greatest "hands on" educational experience) the water balloon "War Between the States" - a.k.a. War of Northern Aggression in some parts - imparting fundamental projectile motion physics to the cannoneers of both line. I get excited speaking to other teachers about Ben and his ever-growing body of work and the passion of his instruction and guidance. This is a great cause and continuing project!" Taylor Farkas - "Dr. Hartnell's class was my favorite class in high school. He is an absolutely amazing teacher. It's been nine years, and I can still remember the exact definition of a 'revolution'!" Caitlin Bonacuse - "This was by far the best class I had in high school. My high school experience would not have been the same had I not gotten to experience the Civil War Water Balloon Battle, the horrific medieval torture lecture, countless engaging lectures and activities, and many, many more aspects that made this class so great. All the costumes and activities helped tremendously with my learning of the subject matter and I hope you can continue to do this for many, many years to come. Cheers to you being unique and going the extra mile to help students learn and enjoy learning!" Craig Brandenburg - "I am continually inspired!" Kerri Lynch Albrecht - "Looks like an amazing classroom experience, great job!" Jason Biddlestone - "We hope you are still teaching when our kids get to high school." Steven Smith - "By far one of the most inspiring classes of my high school career." Gunnar Dircks - "By far the best class and teacher." Brian Griffin - "While I don't know Dr. Hartnell, I certainly remember my teachers at Westerville North who exuded the awesome energy it looks like he brings to his class every day. Kuddos to going above and beyond the call of duty and being the change he wants to see in the world. Dr. Peet, Mr. Weiner, Mrs. Croy...it looks like the next generation is towing the line!"